Risk! Risk anything! Care no more for the opinions of others, for those voices. Do the hardest thing on earth for you. Act for yourself. Face the truth. – Katherine Mansfield. It has been a few months since I last wrote a blog post – I have been learning how to navigate life with a full-time job – but in that time I’ve tried new craft projects, rediscovered my love of research, and have, of late, been entirely obsessed with Katherine Mansfield. To conclude a busy week of work on a high, last night I went to Bloomsbury Women & The Wild Colonial Girl, a play on at the Circa Theatre as part of the 2018 Women’s Theatre Festival. It centres around Katherine Mansfield and celebrates her relationship with two women: loyal friend and carer Ida Baker, and professional rival and fellow literary genius Virginia Woolf. Composed entirely from the letters of Katherine Mansfield and Virginia Woolf, the play tells Mansfield’s life ‘in glimpses’ after she left New Zealand for London in 1908, never to return. Beginning with the Bloomsbury Group – a loose association of modernist writers, philosophers and artists – reminiscing about Katherine Mansfield, the play then soars through Mansfield’s vibrant youth and her myriad of lovers – women and men – and her obsession with Oscar Wilde, before it dips down into her complicated relationship with John Middleton Murray, her years of fleeting travel, her writing success, her poverty, and her devastating illness that so cruelly inhibited her life and her writing. Told all in her own words, Mansfield’s on-stage cry of “risk, risk anything” before her death at age 34 is so much more powerful and affecting than it can ever be when read merely on paper. As a fan of both Katherine Mansfield and Virigina Woolf’s work, I knew I was going to like this play. What I didn’t know, however, was how much I would love it. Having read many of their letters (and the writing of many members of the Bloomsbury Group), it was a visceral experience to hear the words come alive. It was fascinating to see how Isobel MacKinnon (as Mansfield) and Jessica Robinson (as Virginia Woolf and Ida Baker) played the vivacious ‘cat-like’ Mansfield and the prim but tempestuous Woolf with such conviction. The inclusion of quotes from their various works (Bliss; Daughters of the Late Colonel; Night and Day), plus the glimpse-like structure of the play meant the ninety minutes covered an entire life and a wide array of emotion. It was extremely impressive to watch MacKinnon carry out what was essentially a ninety minute monologue, intruded into now and again by Robinson as either Baker or Woolf. The entire play had an electric feel, helped by the beautiful set, backdrop screen (with additional ‘characters’ appearing with portraits and voice-over) and an atmospheric soundtrack. When it ended, I overheard one lady say ‘I knew about her writing but I never knew Mansfield lived such an interesting life!‘ The only issue I have is stopping myself from going to see it again. For my birthday earlier in the year I purchased two titles about Mansfield – one, a collection of her poetry (The Collected Poems of Katherine Mansfield, edited by Gerri Kimber) and the second, the novel A Strange Beautiful Excitement by Redmer Yska. While I enjoyed dipping into the poetry, I loved Yska’s novel. 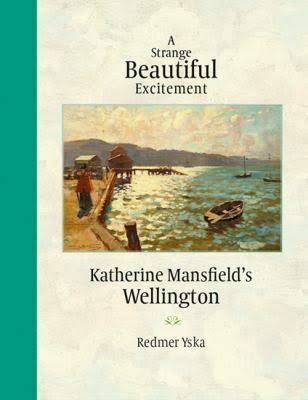 Published by Otago University Press, A Strange Beautiful Excitement covers Mansfield’s early years growing up in Wellington, from 1888 to 1903. It markets itself as a novel rather than a scholarly work, but it is that extremely rare thing which manages to succeed at both. The academic research behind the novel is incredible (including Yska discovering published work by an eleven-year-old Mansfield in The New Zealand Graphic, a full seven years before her previously thought earliest story). The novel really ‘digs deep’ into finding out what life for Mansfield as a child might have been like, including the author literally retracing her steps from home to school; investigating how Wellington city fell victim to a citywide contagion in the early 1890s that affected the Beauchamp family (that is, Katherine Mansfield’s family – her real name is Kathleen Beauchamp) deeply; and investigating the stories of the wider Beauchamp family – particularly her father Harold, her mother Annie, her aunts, siblings, and her beloved grandmother Dyer. The novel is written in beautiful prose, making it an extremely easy (and addicting) read, not a simple feat for a non-fiction work. As well as learning about the Beauchamps, it was also a great novel to learn about the trials of life in early disease-and-poverty-riddled Wellington. Apart from my Mansfield binge, I’ve been spending the last few months getting used to my full-time editing work. While I enjoy the work for the most part, it does leave little time for hobbies. When I come home at night I’m so tired that all I’m ready for is making dinner and getting ready for the next day – hence the need to have hobbies that are relaxing rather than demanding. As much as ‘writer’s guilt’ likes to haunt me, I am learning how to choose a task and relax completely into it, rather than stress because I’m leaving so much ‘undone’ (i.e. writing. Always writing. I should make a post about writer’s guilt one day, but then I might feel guilty about not writing it. I can’t win). The main thing I’ve rediscovered is my love for crafts. Last year I learned how to book bind and create my own notebooks – something I indulged in when making Christmas presents – but over the last few months I’ve learned how to cross-stitch, I am re-learning how to knit (something I haven’t done in at least ten years), and I am planning to learn crochet next. One of my flatmates and best friends also enjoys crafts, and it’s relaxing to come home and watch mindless TV series while indulging in something practical after a day of staring at words on a computer screen. Beyond Mansfield, I’ve been reading in fits and starts recently – finding YA novels I’ve loved (Leah on the Offbeat by Becky Albertalli resonated hugely with me) and ones that I’ve been frustrated with (such as All These Beautiful Strangers by Elizabeth Klehfoth, review to come on The Reader). I’ve been reading some classic New Zealand books as well – work by Fleur Beale and Elizabeth Knox – and am enjoying the non-fiction Sapiens: A Brief History of Humankind by Yuval Noah Harari. I have been enjoying indulging in poetry. I never thought of myself as much of a poetry reader, but it is something that can be delved into and out of with ease. Recently, I’ve loved Chris Tse’s HE’S SO MASC, Helen Heath’s Are My Friends Electric? and Harry Rickett’s Winter Eyes. Each collection felt delicate yet powerful: Tse’s for its personal and deftly confronting nature, Heath’s for its balance of academic exploration into futuristic possibilities and entwined personal narrative about human life and loss, and Rickett’s for its beautiful yet complex forms. With all this reading, I really must get back into writing despite it feeling like work – perhaps urged on by Mansfield: ‘Do the hardest thing on earth for you’.